There are countless cases of overage citizens being permitted to continue to work well past the official retirement age for civil and public servants in the country. And so it is not wholly accurate, contrary to what Mr. Paul Adom-Otchere, the renowned Ghanaian journalist and television program host, would have the rest of us believe (See “Amidu’s Popularity Could Affect Supreme Court Case – Adom-Otchere” Citifmonline.com / Ghanaweb.com 2/15/18). And that list of distinguished and notable overage Ghanaian public and civil servants includes Profs. J. H. Kwabena Nketia and K. A. Dickson, late, both formerly employed by the country’s foremost and flagship tertiary academy, the University of Ghana, Legon. I believe Prof. Dickson, an erudite Old Testament scholar, also became the Presiding Bishop of the Conference of the Methodist Church of Ghana. Indeed, my own maternal grandfather, the Rev. T. H. Sintim, was still walking, for the most part, the 3-mile journey from Akyem-Asiakwa to Segyimase when he was well over 70 years old, to teach first- through third-grade pupils, during the 1970s, because there had been an acute shortage of professionally trained teachers and the preparation of the future generations of Ghanaian citizens and leaders could not be unhealthily put on hold. And, by the way, my grandfather also taught the future pacesetting Prof. Nketia in third grade at the Asante-Mampong Presbyterian Primary School during the late 1920s. 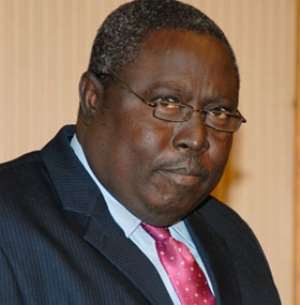 The country’s Fourth-Republican Constitution may be young, but the entire decision by Dr. Dominic Ayine to sue to have Mr. Martin Amidu disqualified from assuming his post of Independent Special Prosecutor is absolutely nothing new, as even Mr. Adom-Otchere has himself pointed out. But what is equally important to point out, while we are still focused on this subject, is the patent and inescapable fact that Dr. Ayine’s suit is one that is purely borne out of mischief and malice. From the very moment of the nomination of the former Attorney-General and Minister of Justice by President Addo DankwaAkufo-Addo, Dr. Ayine, who is also the National Democratic Congress’ Member of Parliament for Bolgatanga-Central, if memory serves yours truly accurately, has been incessantly firing very public and virulent rhetorical shots – both in the electronic media and in newsprint – eagerly seeking to have the putative ideological arch-nemesis of the key operatives of the main opposition National Democratic Congress summarily disqualified from assuming this most publicly feared of political portfolios. And the preceding was long before Dr. Ayine, who is also a former Mahama-appointed Deputy Attorney-General, went frantically and enviously nitpicking and accidentally discovered to his rapturous delight that at 66 years old, Mr. Amidu was slightly above the official retirement age for Ghanaian civil and public servants. Even so, the several cases enumerated at the beginning of this column clearly point to the fact that the purely “contractual” appointment of Mr. Amidu as the Independent Special Prosecutor, is absolutely nothing new. Properly speaking, to be certain, it is decidedly pedestrian, for tens of hundreds of such cases abound throughout our country’s history and span from the colonial era. So critically thinking and speaking, Dr. Ayine may very well have needlessly embarked on a wild-goose’s chase, as Americans are wont to say. If the blowhard Mahama Deputy Attorney-Attorney – we all witnessed this aspect of his character during the infamous AMERI-Deal probe – loses his case before the Supreme Court, and he is almost certain to lose, it would not be on account of the “universal” acclaim or popularity of the Independent Special Prosecutor-Designate, as Mr. Adom-Otchere would have his audiences and the rest of us believe, but primarily because Dr. Ayine’s suit is clearly much ado about absolutely nothing besides sheer envy, anxiety, jealousy and self-serving malice. Indeed, as pointed out in a previous article, as one of the architects or executers of the infamous AMERI-Deal energy scam, in which the hardworking Ghanaian taxpayer was criminally and unconscionably extorted and bilked to the tune of tens of millions of dollars, Dr. Ayine’s suit is about anything but the healthily jealous and patriotic protection of the integrity of the country’s Fourth-Republican Constitution.